Single Stage cementing(Primary cementing) is the initial type of cementing which is done just after drilling and running casing, and is done in single stage i.e cement is pumped in only once. First the casing is run with all access in the whole untill the casing shoe is a few feet off the bottom of the hole and casing head is connected to the top of the casing . The casing is then circulated clean and the first plug (wiper plug) is pumped which is followed by spacer and cement.wiper plug as the name suggests is for wiping the casing clean of any contaminants.At last the second plug (shut off plug) is dropped. when the first plug will reach the float collar it will rupture which will allow the spacer and cement to pass through the bottom of the hole and up the annulus. After further displacement the shut off plug will reach the float collar and will land on wiper plug and displacement process will be stopped.Pumping is slowed down as the second plug is approaching the float collar.The shut off plug should be pumped gently as bumping increases the tension load. Then the casing is pressure tested. 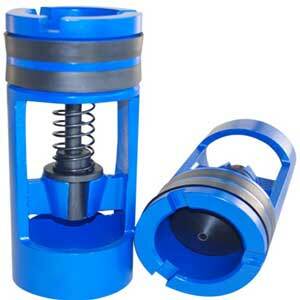 This pressure is then bleed off slowly to ensure that the float valves are holding. It is a common practice to under-displace cement which means cement is displaced up-to float collar and some cement is deliberately left in the casing. Otherwise cement may get over-displaced and their may be no cement under the casing shoe, which may yield under high pressure. 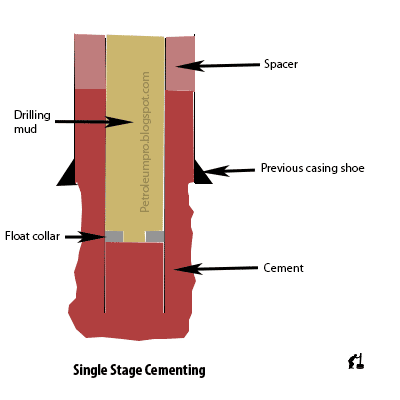 Usefull knowledge about single stage cementing but diagram should also be added with it.